• Truckers with a Russian accent. Time magazine recently published an article Trucking in the U.S.A.: Where the Accent is Russian. As an ethnic profile of Canadian truckers more or less similar to that one in the US, we would like to share with you, our readers, a few excerpts from the article. No one quite knows how many of them there are out on the roads. But you can usually hear who they are when they talk, when they've taken a break from hours and hours of driving on America's highways. Take the two guys who are resting in Red Lodge, Montana, about 60 miles from Billings, after hauling bottles from Oklahoma to a mountain microbrewery here. They are agonizing over what to eat off the menu, asking me questions in halting English, even as they express a longing for the Russian black bread, pan-fried with garlic in oil, of the old country. Or this other Russian, who has just driven a double-deck trailer loaded with a motley assortment of autos out of Philly. He's just brought a Pizza Hut order into the lounge, downed a couple of shots of Canadian whiskey and picked up four bottles of Bud Lite to go to his room and watch TV. Then there's Phillip Dmitriev, 50, who has driven into Billings bound for Indiana with a load of electrical coils. It's the middle of a thunderstorm and he only has enough time to fuel up and head back onto Intersate 90. But on the cab door of his Freightliner truck is the imperial crest of old Russia, the double-headed eagle, glistening with raindrops. It is the proud insignia of Mikhail Trucking, a transport company in Spokane, Washington, founded in 2006 by brothers from Russia. Every working day at my job at the postal processing center in Billings, there are drivers speaking Slavic languages — for the most part, Russian — making drop-shipments of pallets loaded with bulk mail. They haven't taken over the business of cross-country freight trucking, by any means. But, at least anecdotally, they are a distinct and growing presence. As such, the former denizens of the moribund Soviet bloc seem to be another example of how some immigrant groups tend to cluster around professions and locations, forming cultural and economic ghettoes — for example, Chinatown restaurants or the Filipino medical workers who seem to fill the labor needs of many hospitals. The Russians are a bit different because the niche they are filling takes them across the face of the U.S. They are both transient and ubiquitous as they help transport America's material needs to the far-flung corners of the country. At least 80% of the country's communities receive their goods exclusively by truck, according to American Trucking Associations. The authors linked below the “Russian” infusion in the trucking business in North America with “famous” default in Russia in year 2008. In fact, Russians and other men and women from Eastern Europe became an integral part of trucking in the USA and Canada much earlier. As early as the seventies of the last century, or maybe even earlier. The Russians come to trucking with some tradition — it is very much the way their huge ancestral nation, with its system of badly maintained roads, takes delivery of its necessities. Indeed, many may have come over to join relatives in the U.S. after the global financial crisis in the fall of 2008 depressed the Russian trucking industry: out of the more than 10,000 companies that operated in Russia before the crisis, only around 8,000 survived. "This did cause something of an exodus among Russian truckers," says Antonina Kamchatova, spokeswoman of ASMAP, the Russian trick drivers' association (Based in Moscow, Russia – DR). "So anyone who could, through the help of relatives or whatever, went across the Atlantic in the last couple of years to look for work." As with all immigrant groups trying to make it in America, there are problems to do with acculturation and, more seriously, the law. Many drivers demonstrate limited English-speaking and comprehension skills; some have trouble reading Latin script. A few that I have talked to admit that they are much more used to reading Cyrillic. 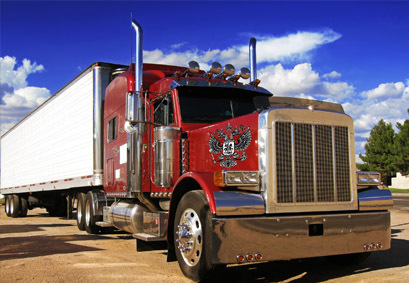 To work as a trucker in the U.S., an individual must have a Commercial Driver's License, which requires that a driver "read and speak the English language sufficiently to converse with the general public, to understand highway traffic signs and signals in the English language, to respond to official inquiries, and to make entries on reports and records." Nicolay Karpov, the manager of Mikhail Trucking, says his brother Mikhail "studied night and day for six months to pass his CDL test. His English might not be so good, but he can understand, and read and write okay." The Karpov brothers now own a company of seven trucks that haul dry freight through 48 states and western Canada. Nicolay himself does office work, eschewing the road. His brother Mikhail, though, "is passionate about trucking." There have been licensing scams. Many states do not administer CDL exams, outsourcing them to private companies. Some tests have been seriously compromised. In St. Louis in 2008, for example, Mustafa Redzic, owner of the Bosnia Truck Driving School, was convicted of bribery, conspiracy and fraud and sentenced to 75 months in prison, followed by three years of supervised release. Prosecutors charged that Redzic's students were given shorter CDL tests or no tests at all after Redzic bribed the manager of a testing facility, resulting in at least 469 ill-gotten CDLs. The manager of the testing facility received a sentence of a year and a day in jail. Missouri has since halted third party testing, handing the process over to the Highway Patrol. A 2010 legislative audit of Utah's drivers license division found incidences of fraud and minimal oversight of the state's 300 CDL testers; it alleged that some immigrant applicants were found using electronic translation devices to take the test. It declared: "There is a great risk that those drivers do not properly know how to drive a commercial vehicle. This poses a risk to everyone." Nicolay Karpov scoffs at the idea of any kind of interpreting help during CDL exams. "The interpreter will not be with you on the road, helping you drive after the test." In late August, federal prosecutors in Pennsylvania indicted nine people for allegedly running a scheme to sell state CDLs to ill-prepared drivers. Vitaliy and Tatyana Kroshnev allegedly billed hundreds of students — many of whom were Russian-speakers — coming from 26 states at their International Training Academy for up to $2,200 each to successfully pass their CDL tests, and, according to the FBI, they are accused of enlisting "foreign language interpreters who gave applicants the answers to the written commercial driver's license permit test." "It places the entire public at risk if persons receiving fraudulent CDLs are driving large vehicles," says Michele Morgan-Kelly, Assistant U.S. Attorney for the Eastern District of Pennsylvania. "You have the biggest things on the road that can do a lot of damage and safety standards are being violated." The kind of damage that can be done was demonstrated in December 2008, 400 miles west of Billings on I-90, when a semi out of New Jersey pulling two trailers traveling at a high rate of speed jackknifed on the icy highway, slamming into a local emergency vehicle, killing fireman Jerry J. Parrick, 51. After a long investigation, the driver of the semi, Sergey Buslayev, 56, was extradited from New Jersey to Montana in late July, to face charges of second degree homicide and criminal endangerment. At the initial arraignment hearing, the judge discontinued proceedings until the court could find an interpreter. "Sometimes I understand good, and sometimes not," Buslayev told the judge. Last week, Buslayev pleaded not guilty to both charges and remains in custody, unable to post bond. It's all enough to make you wonder why the immigrants want to be long-haul drivers in the first place. The conventional wisdom is that truckers make a dollar per mile they drive (a 10-hour non-stop work day being worth $600 or more); but, according to the Bureau of Labor Statistics, the median wage for truckers in 2009 was actually just $37,730 — which is itself much less the median U.S. family income of about $45,000. Todd Spencer, Executive Vice President of the Owner-Operator Independent Drivers Association, which has 154,000 members, believes many foreign-born drivers are simply exploited by the industry. "People in trucking are kind of predatory, in terms of capitalism. These drivers are being exploited because of loopholes in the regulations and lack of enforcement." He adds, "The attractiveness of these folks is simply cheap labor. There are 500,000 CDLs issued every year. But many new drivers go right out of the business. The dollars, the hours, they don't compute." Some Russians come to the business with some desperation. ASMAP's Kamchatova says the truckers who remain in her country "are just barely breaking even. They have just enough to pay for fuel and basic necessities, bread and shelter. So a lot of them are going abroad. Here in Russia, there's just nothing left for many of them." But, says Nicolay Karpov, "for most of the guys who immigrated here, this is the best way to make enough money to take care of their families. If they come here, and they have no diploma, can't speak English and are over 35, trucking is the easiest way to make some good money." He insists, however, that getting a grasp on English is a must. "If you can't read and understand basic English," says Karpov, "you should not be driving a commercial vehicle on the road, 24/7. It would be bad for everyone." Even in America, though, the trucker's life is not an easy one. Karpov says his drivers usually are two weeks on the road and two weeks at home so "they have some time with family." And, he adds, "You don't make all the money in the world." But compared to Russia, America is a dream, even if his drivers face sporadic instances of discrimination or hostility from state inspectors at weigh-stations. "Sometimes," he says, "the inspectors laugh at us like we're stupid or something. [Our drivers] do sometimes feel they are discriminated against because they talk with the accents." But, he says, for the most part, the inspectors simply do their job. "For me," he continues, "this is the nicest country. I saw more discrimination against foreigners in Russia than I do here." As the national unemployment rate remains at 9.6 percent with Friday's jobs report, there's one part of the U.S. economy that is desperate for workers—or rather, drivers. According to several trade groups in the trucking industry, there could be a shortage of drivers next year, and the estimates range from 200,000 to as many as 500,000. At first blush, a person might ask: Who can't drive a truck? But that is part of the problem. New regulation is entering the industry, and the higher standards will knock some drivers off the road. On top of that, Baby Boomers are beginning to retire in large numbers. According to shipping giant UPS, it could lose 25,000 drivers to retirement over the next five years alone. "We are already seeing a contraction in (driver) supply," said Stephens Inc. analyst Jack Waldo, who added that this is more than a short-cycle issue. "This is a systematic 5-10 year problem." Another part of the labor shortage is the uptick in demand. As the economy has moderately recovered, so have freight volumes. Businesses need to expand, and that sparks another leg of driver demand. There is a counterforce here as well. Even though the U.S. jobs picture has not markedly improved, it has not worsened. For many, driving a truck is a last resort. Average salaries are under $40,000, and the job doesn't carry many of the pension benefits it did a generation ago. However, Waldo says the job profile will soon get better—as the need for drivers spikes. "I don't think we've spoken to a single truck driver who has said wages will go down in the next 12 months," said Waldo. Perhaps the biggest take-away, beyond showing a sector full of job opportunities, is the simple fact that as shipping costs filter through the economy, they will ultimately mean higher prices for businesses and for consumers.